A lot can happen in two days. 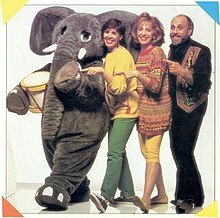 You can squeeze quick workouts in, take a four hour flight, find yourself at a table with Sharon Hamson of Sharon, Lois, and Bram fame (“Skiddamarinky-dinky-dink, skiddamarinky-do-I love you!”), and not win a BMW that you thought would solve your we-need-a-car problems. Whew! It’s been a full few days and some neat things have happened that I’d love to share with you guys! Post-workout, looking a little more alive and happy to have moved! Then, fully loaded and ready to go, we grabbed breakfast with my in-laws at one of our favorite spots, the Diner Deluxe. It was great to have the chance to talk and catch up as our paths haven’t crossed much lately with how busy we’ve been. The atmosphere was funky and lively, as usual, and the food delicious: I got a single buckwheat pancake with maple squash butter, an over-medium egg with some sautéed vegetables on the side. Side dishes for the win! That’s the way to go for an indecisive girl like me in a restaurant where ALL the food is great! Our flight was pretty uneventful until the end, when the man next to us overheard where our hotel was and said it’d be a $100 taxi or more than an hour bus ride with all our gear. He kindly offered to drive us to our hotel since he lives nearby – what a great start to our time in Toronto! Thanks, Dave! And the Hilton Garden Suites exceeded our expectations! Pretty swanky, no? We had only eaten breakfast and by the time we checked in it was about 6:30 pm, so we perused the hotel restaurants. Unwilling to pay the prices we saw, we walked across the intersection and found a small, VERY authentic eatery called the Won Ton House. It wasn’t quite what my mouth was looking for, but the egg noodle soup with beef strips and shrimp won tons filled me up. We stopped for some ice cream at McDonald’s on the way back and both pretty tired, hit the hay early. Sunday started out happily after an amazing sleep in our luxurious king-sized bed! I realized that we had to get going with our day (breakfast, shower up, iron clothes, be ready by 11 am) for the 23rd annual CIBC Hope Awards so I did a quick high intensity workout and tabata in our room. It’s so easy to squeeze these workouts in, you guys – you just can’t leave room for excuses. Put your workout clothes on, get moving, and get it done. Here’s what I did – it’s a two-parter! Begin on the ground and use your whole body to jump up w/one leg forward like you’re surfing, then jump back down and repeat w/the other leg forward. Each jump = 1 rep.
Squat down and kick one leg forward as you stand = 1 rep. Repeat w/opposite leg. Begin in plank position and drive your knee to your chest. Each drive = 1 rep.
Jump up driving both knees toward your hands. Each jump = 1 rep. Killa! Yikes. Not the best form (getting tired! ), but you know the drill. Modify these in any way needed (knees, incline push ups, etc). Jump your legs out, in & out then up; in, out & in then up. Your little hop alternates from a wide-stance to feet together. Do as many as you can during the 15 seconds of movement! Let that heart rate soar. It was a combo workout that hit the spot and took me about 16 minutes total – that’s it! I was wiped out and feeling GREAT after this start to my day. I’ve decided to focus on high intensity training rather than running in the last few weeks and am loving this change in workout direction. I’ll still be running and enjoying my stress-relieving, endorphin-giving workout of choice, but with the colder weather and desire to lean back out I’m happy with this shift. Plus, you can’t beat the fast and furious best bang for your buck that this type of training provides. From here, we got dressed up and headed downstairs to enjoy the gala we were attending. The afternoon started with a fantastic Michael Jackson impersonator who rocked it out with two other dancers! He sang Billy Jean and Thriller (very appropriate for Halloween-eve) and put on a great show! There was also great food mixed in with the speeches, fundraiser updates, and generous people introductions. One of the best salads I’ve ever had: mixed greens with carrots, tomatoes, candied pecans, toasted pumpkin seeds, candied pecans & feta cheese with a light green tea dressing. YUM! Chicken with sweet potato cubes, asparagus, grilled peppers and an apple-rhubarb crumble rounded out the meal (I’m a chocolate person and only had one bite, but I did have a small glass of red wine and a cup of black coffee afterward). Great food! Then, it was time for the awards. I was so proud of Mikey for receiving the Hope Award and couldn’t believe we were there at the honored table. We truly did not realize what a big deal this event was until we got there, and it added to the weightiness and fun of the day. We were surrounded by many other deserving recipients including MJ, the founder of Rethink Breast Cancer and Sharon of Sharon, Lois, and Bram! Yes – the “Skiddamarinky-dinky-dinky” folk singer herself! It was a great event and we are so thankful to have been a part of it! The rest of the evening was perfect for real relaxing: reading books in the hot tub, putting our PJS on, and watching some 30Rock. Oh yeah! What a great few days! And so hard to believe it’s all happened. Tomorrow we’re meeting some friends, relocating to a downtown hotel with our gear, and prepping for a Tuesday night screening of our film at the Princess Margaret Hospital. Special thanks to all who made this happen today and for their hard work! It was an incredible event and many great things are going on in the GTA (Greater Toronto Area)’s hospitals! Have you ever been to a fancy fundraiser or gala? This was our first of this magnitude for sure! Tell me about your weekend! Any fun Halloween plans? Please, eat some free candy for me! Happy Halloween! Live well & be well friends! As always, WAY too much to comment about. Loved the workouts…doubt that you need to “lean out” HA!…your dress was stunning! Mikey cleans up nicely….that salad sounds amazing – green tea dressing? need it!! Um…and can I come stay with you?! Glad you’re having a blast!! You deserve it!! Proud, Proud, Proud…did I say that I am proud of you guys! Great award Mikey! Wow! Workout was stellar…you remind me Zuzanna in a hotel room doing her workout…great job…good job photographing it too! Wow…what a blast your trip seems like…! “You are as skinny/fit/strong as your choices” I’m still working on the exact wording so if any of you out there in blog land tweek it a bit and come up with something better then I will paint it on my gym wall! Congratulations to Mikey! what an amazing award to receive! That’s so cool that you were sitting with Sharon.. i LOVED that show when I was little. So many exciting things going on for you two and I’m so happy for you both!! Thanks for sharing the workout.. no matter where you are, it seems you always make time for a workout. I love that about you and it inspires me to do the same. I wish we could see each other with you being so close!! Life to the Full · Cardio vs. HIT–what’s the best workout?